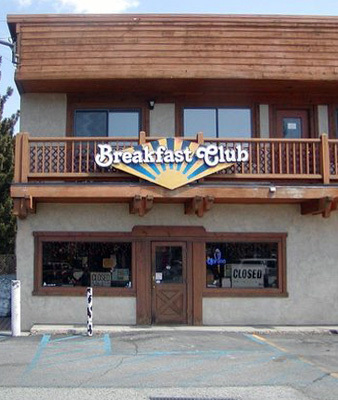 One of the best things about the Shiloh Inn is that The Breakfast Club is next door. Before you decide where to stay, however, you are going to have to decide how long to stay. If you don’t live in the mountains, I would suggest at least three nights. I recognize that adding three nights to your time away can be difficult, but so can HAPE and HACE. Spending three nights (and all or part of four days) at a higher elevation can give you a tremendous head start at acclimatizing to the backcountry. There are some disadvantages, though. The most significant is that Yosemite Valley, at 4,000 feet, is not very high. You’ll certainly gain some benefit if you are coming from a home near sea level, but you will likely be above 8,000 feet on the second day of your hike, and it will be nearly a week before you descend to Red’s Meadow. The other disadvantage is that it is hard to get reservations, unless you can make them a year out. The park fills up quickly, particularly in the summer and fall. My choice is Mammoth Lakes; it has a lot to recommend it. First, you can fly right into the town from either San Francisco or Los Angeles. A cab ride to one of the town’s hotels from the airport is about $20. Speaking of hotels, I like the Shiloh Inn. It is inexpensive, near one of the town’s shuttle stops (more on that in moment), has a restaurant next door with the best huevos rancheros I have ever eaten (The Breakfast Club), and is mere steps from the YARTS bus stop. You will take the YARTS bus into the valley the day before you begin your hike. Mammoth Lakes also happens to be a delightful place to relax for a few days. The town has a scheduled shuttle that is free, and it will take you to good restaurants, a movie theater, and a number of well-equipped outdoor stores, in case you want to make some last minute changes to your gear list. Most importantly, at nearly 8,000 feet, by the time you leave for Yosemite Valley you will be ready for the high country ahead. Ray, I have a question that you might be able to answer. I’m hoping to hike the JMT at the end of July 2015. Now, I like to fly place midweek because the flights are cheaper. If I took three days to acclimate, that would have me probably starting out on the trail on the weekend. Is it harder to get a permit on weekend days (ie. more demand) or is it pretty much the same no matter what the day? Great question. Demand tends to fluctuate more depending on the month and less on the day of the week. I would guess that demand starts to ramp up in June, pretty much peaks around the middle to the end of August, and is back down by the beginning of October. If you are shooting for the end of July, there will probably be more requests for Friday, Saturday and Sunday, but not tons more. The simple truth is that it will hard to get a permit at the end of July, particularly if you are really fixated on a certain day. A much better strategy would be to identify a four day window and apply on consecutive days until you get something you can work with. The number in your party is also very important. Solo hikers are the easiest, by far, to accommodate. Even if you are the tenth request down when all but one quota has been used up for a particular day, you still may get that last spot because the nine ahead of you are all requesting two or more spots. If all else fails, you can wait outside the Wilderness Center the day before to get one of the “walk-up” permits. So, to answer your question, directly: yes, there are more requests during the weekend that the weekdays, though all days are in high demand. Thanks Ray! I was definitely planning on a window of days…but before your blog post, I wasn’t accounting for acclimation days so I thought I’d be requesting to start somewhere mid-week. Then I realized “Oh, if I want to travel on a Tuesday or Wednesday, then I’ll be starting probably on the weekend.” As of right now, I think I’ll probably be going solo so I figured that would help. I don’t want to set my cap on trying to get a walk-up permit since I’ll be traveling from the east coast to get there! One last thing, Jill. Although I am a huge proponent of getting your permit ahead of time, for a solo hiker who is willing to show up shortly after midnight the day before the hike (and endure an eleven hour wait [no sleeping! ]), you will virtually be assured of a permit. There ARE exceptions, like if a fire has a trail head closed, but those risks are present even with a reserved permit. Of course, it’s possible that you would get there and there would be a dozen people ahead of you, but that’s unlikely.